Here is a spot of code to create a series of small multiples for comparing return distributions. You may have spotted this in a presentation I posted about earlier, but I’ve been using it here and there and am finally satisfied that it is a generally useful view, so I functionalized it. When visually comparing distributions, there are a few characteristics to get right across the graphs. For example, each histogram’s bin sizes should match and the min and the max of each chart should line up. I prefer all three views together. The histogram is a more typical view of the distribution, improved when overplotted with a normal distribution and with the zero bin marked, both being important references. 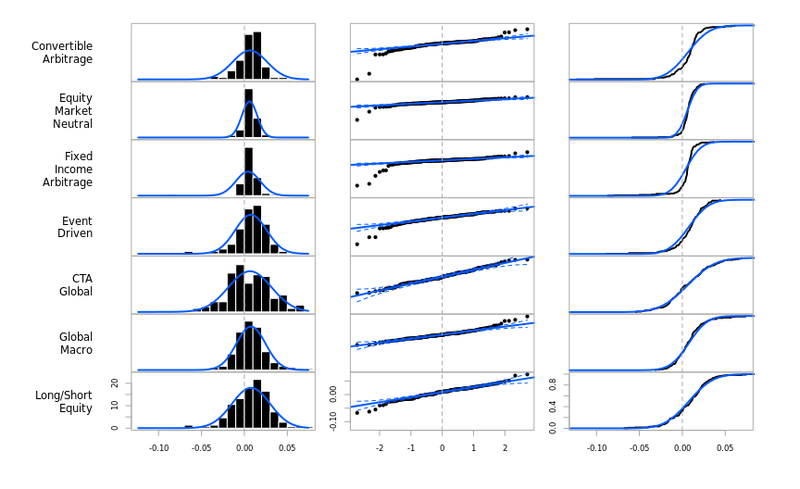 The QQ plot is more important, again improved with confidence bands for a normal distribution. This is just a first cut. There’s no reason that the normal distribution has to be the reference for these charts, but I’ll have to do some more parameterization. There is also a balance between the number of rows in the device and readability. Maybe I’ll insert some “pagination” like charts.BarVaR uses… What else?